A top-notch performance steering system is now within grasp of 1973-73 Mustang and Cougar owners. With a bit of trimming, welding and a common set of hand tools Total Control Products (TCP) patented power rack and pinion unit can bring your later classic to a new level of confident handling. The quick-ratio rack rounds out the ultimate performance package when matched with TCP's front coil-over conversion and g-Link rear suspension. 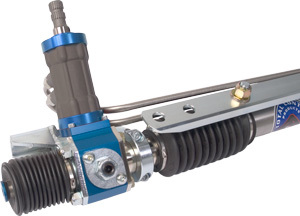 Backed by extensive engineering and manufacturing expertise, the Total Control Products rack-and-pinion systems are the premiere steering solution for 1964-73 Mustang/Cougar and 1960-65 Falcon/Comet/Ranchero. Maintaining correct steering geometry, full centerlink travel, and a high level of positive, direct steering without decreasing ground clearance or obstructing header clearance is unique to Total Control’s patented design and not possible with OEM-based units. Rack and pinion kits ship complete with intermediate steering shaft, and U-joints for OEM column; tie-rods optional. Installation video, data sheet and price information available online.